DUBUQUE, Iowa – The City of Dubuque Leisure Services Department has designated nine public parks where pesticides will not be used and has created a notification system for when it will apply chemical treatments to weeds, insects, and other pests at other public parks and right-of-ways. The pesticide-free parks are: Cleveland Park (625 Cleveland Ave.), Falk Park (1701 Earl Dr.), Southern Park (200 Southern Ave.), Welu Park (3655 Welu Dr.), Teddy Bear Park (4900 Gabriel Dr.), Riley Park (3356 Lunar Dr.), Allison-Henderson Park (1500 Loras Blvd. ), Pinard Park (2819 Pinard St.), and Maus Park (599 Huff St.). A map of the parks is available atwww.cityofdubuque.org/ipm. These parks were chosen because they are located throughout the Dubuque community, giving all residents access to pesticide-free areas, and because they consist of landscapes that can be managed without the use of chemicals. New signs have been installed in each of these parks showing their designation as pesticide-free parks. In addition to these nine pesticide-free parks, Usha Park (3937 Pennsylvania Ave.) is being designated as a “zoned park.” No chemicals will be used in the park with the exception of the parking lot area where a bio swale was recently installed. Chemicals may be used in this small area during the establishment of the plants in the bio swale. No chemicals are used to manage the landscape in the entire footprint of these parks. Instead, staff created maintenance-friendly landscapes that reduce the need for weed management and employ mechanical techniques such as mulching, mowing, string trimming or hand-weeding to manage weeds. Because techniques like weeding and mulching are more labor intensive, volunteers are encouraged and should call the leisure services department for more information. 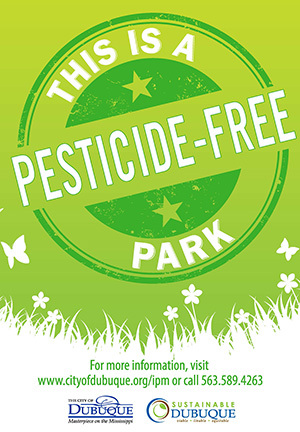 If it becomes necessary to apply pesticides at a pesticide-free park due to a public health or safety threat, notification will be clearly posted at the site before, during, and after the application to inform users of the situation. The designation of nine pesticide-free parks is part of the City’s process of developing an integrated pest management (IPM) program to reduce chemical use in the City’s outdoor spaces and facilities. Implementation of the IPM program is an ongoing process, and staff continue to explore the most effective and least toxic method for controlling pests. The leisure services department continues to work to implement an IPM program in City parks. Employees have designated areas where pesticide use is restricted, improved park design to limit future need to use pesticides, and have identified best practices in park maintenance to minimize pesticide use. As part of the department’s review of its practices, it was decided that play structures with a defined boundary of the playground safety surfacing (mulch, sand, etc.) will also not be treated with chemicals. The City currently has 285 of these defined playground structure spaces. The only time these areas will receive chemical treatment is when there is a threat to public health and safety, such as a nest of bees or wasps in or on the play equipment. Notification of chemical use would be clearly posted before, during, and after chemical application. Although pesticide use has been greatly reduced in Dubuque’s 40 other parks, pesticides are used when necessary to manage noxious and invasive weeds, as well as pest infestations near higher-use areas. With over 1,000 acres of parks and open space to maintain, the leisure services department uses pesticides at times as a cost-effective method to steward public land. The leisure services department has created an email and/or text notification system to notify residents and stakeholders who wish to be informed when and where chemical treatment of City parks will occur. To receive these notifications, please visit www.cityofdubuque.org/notifyme and subscribe to the “Pesticide Application Notification” Notify Me option. Leisure services is only one portion of an overall Integrated Pest Management Program being developed for the City of Dubuque operations. This program is to be presented to the City Council onJune 20, 2016.